Put on that cowboy hat and click your spurs together, because it’s time for Saloon Poker. 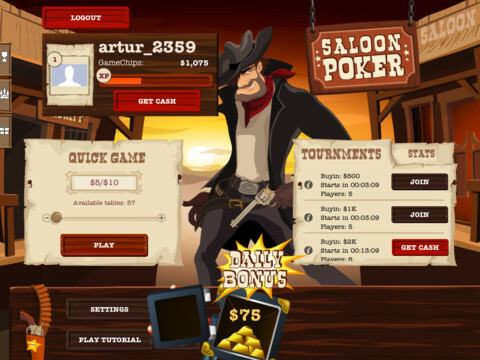 Chillingo‘s latest gambler is nicely executed, but the fact that all players have to register via their Facebook profile is for many, enough to kick this poker game out of the saloon and off the iPad altogether. Before Saloon Poker lets anyone through the saloon doors, the first they they do is ask gamblers to login via their Facebook profiles. 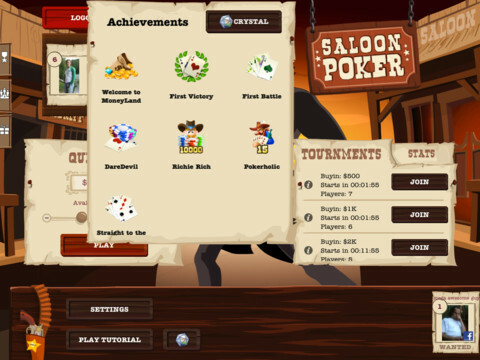 If you have any desire to play, let Saloon Poker take you to a new browser window where you give the developers permission to collect your information, click allow, and you’re through. Although this login procedure starts many people off with a bitter taste in their mouth, this is Saloon Poker’s biggest flaw. Perhaps more important, in all my poker playing, Saloon Poker never shared my information without asking. Of course the game asks to share your achievements any opportunity they get, but at least they’re not plastering your poker habit for all your high school friends to see. 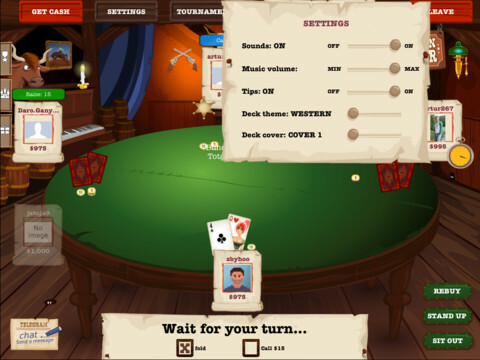 After you’re all logged in, Saloon Poker kicks you into gear with a quick tutorial explaining everything from how to pick your seat at the poker table to the general conventions of the game (e.g. the value of each hand, what each move means, etc). Basic buttons like Check, Call, and Raise all make poker playing extremely simple, and although some poker playing skill certainly helps, you don’t have to be a world class poker champion to get in on the fun and win a few key hands. 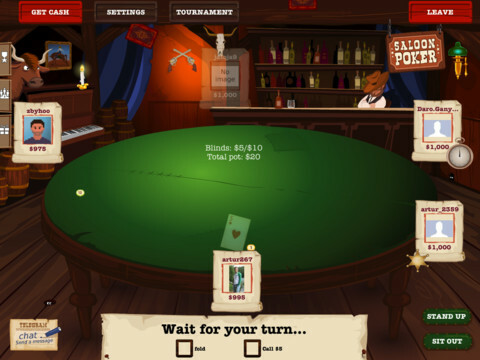 After you’re through with the tutorial, Saloon Poker kicks you out into the wild to play against other real people live. This is the game’s strong suit. 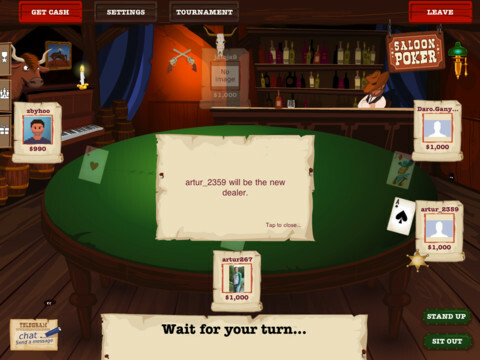 In the saloon lobby you can join other games or tournaments (all with different buy in amounts) or start your own. There’s a short countdown before the game begins (in which people start gathering around the table), and then everything goes live. When the game starts, someone is assigned as the dealer and each player has a certain amount of time to make their move. 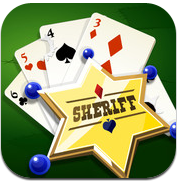 This keeps the game going at a steady clip, and the easy interface makes the poker game extremely easy to understand. You really can’t mess saloon poker up, unless, of course, you lose all your poker chips. If that ever becomes the case, you can move back into the saloon lobby, press “Get Cash” under your profile, and choose to buy anywhere from 20,000 to 480,000 GameChips for prices that range from $1.99 to $19.99. This is, of course, how Chillingo plans to get their money back from gamers. All said and done, the game itself is pretty fun. The graphics are solid, the iPad screen makes for a great poker table layout, and Chillingo makes it easy to put those poker chips on the table as the saloon tunes play in the background. Two deck styles and other options add a little variety to the mix, but ultimately it’s hard not to feel a little swindled in this saloon. Bottom Line: Saloon Poker is a solid live poker game, but at the end of the day the Facebook login and pay-for-more-poker-chips model makes it awfully tempting to find another gambler game in the app store.